SFist can't even begin to recall the number of times it has aimlessly wandered past the Imperial Tea Court in San Francisco's Ferry Building Market Place and wondered why it appears to be less populated than its thriving surrounds. It always looks so peaceful and calm. It resembles a haven in a pop video where everything important luxuriates in sensuous slow motion as throngs of shoppers speedily time lapse by. When we can take no more of the Saturday Farmers' Market crowds, when we tire of tourists bumbling around in front of us, when the line for ATM seemingly stretches further than Berkeley, when no little nook or cranny in the Market Place offers total respite from the bustle, we quickly retreat into the tranquil surounds of the Imperial Tea Court, to satisfy our curiosity and find out about the way the Chinese serve and drink tea. Our Englishness, with all its penchance for tea drinking, admits to a total lack of knowledge about the chinese approach towards the same obsession. Hence we find the Imperial Tea Court to be a wonderful place to go for a beginner's education. Ignorance is bliss and we have absolutely no clue whether we are in a tourist rip-off joint or an authentic charming authentic tea house. Unusually for us, we have not done any advance research and so, instead, we determine to take pleasure in the experience purely at face vaue. Peaceful music, echoing sounds of the forest and the sea seranades us as we choose our place at one of the austere, lacquered, dark wooden tables. The equally-polished shiny chairs are stiff and unforgiving, the table top is far higher than standard and we can't make ourselves terribly comfortable, so we ready ourselves for a more formal occasion instead. The patient and informative waitress brings me the Teas Services menu and kindly helps me choose Superior Yunan, a beautifully aromatic, robust black and gold tip tea with superior body and long lasting flavour $5. She assures me that it is quite acceptable to eat dim sum at such an early hour (for the sake of argument, we will call it 'brunch') so I also order the Dim Sum Sampler Platter $6.50 and then people watch whilst I wait for her return. Because we are dining alone, our tea preparation can only be Gaiwan. We may be English, but instead of milk and sugar we have drunk our tea black for longer than we can remember, so the Chinese method isn't so alien to us as it could have been. What is most interesting is that the tea is actually brewed in the cup itself and there is a little lid on top of the cup that acts not only as a strainer, but also as a retainer of heat. This fascinates us. We enjoy cup, after cup, after cup of piping hot tea from this one preparation. Our regular daily British breakfast brew would have cooled down in a tenth of the time. The tea itself is heartier and more forceful than the more delicate Twinings leaves we are used to. It has quite a kick. It certainly wakes us up and gives us back some of the strength we need to carry on shopping. But, before we can face the crowds again, we need some sustenance too. 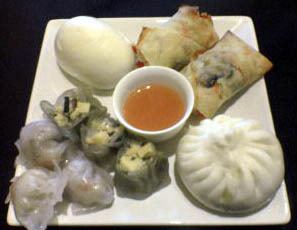 For $6.50 our dim sum plate is full of variety and volume. Shamefully, it has been a few years since we last ate dim sum. Imperial Tea Court somehow doesn't strike us as the place where we will find the best dim sum in the city, but we determine to give it an objective opinion all the same. Although the vegetarian Spring Rolls with tofu, cabbage, carrot and their accompanying dipping sauce are bland and tasteless and the open-skin tofu and mushroom dumplings are a little too slimy and flavourless, the vegetarian steam buns are an absolute delight. Soft and chewy with an intense filling of baby bok choy and shittake, these little pillows taste overwhelmingly of the colour green. We would have been more than satisfied with just an order of these. But then we might have missed out on the unique dumplings packed tight with shrimp and jasmine tea in a chewy translcent skin that not only look adorable but taste wonderful too. We have little room left for the dessert - another squidgy bun, this time containing sweetened red beans. It just doesn't have the same pleasurable impact as its savoury counterparts. As we savour the peaceful atmosphere a few more minutes in this tranquil setting waiting for our check we think we might spy James Ormsby at another table. Whether it is really him, or just a look-a-like, we are inspired by the thought that we might just have to pay a visit to his restaurant for our next review, beginning with the letter J. It's something promising to look forward to before we venture out into the fray of the market once again. We've not been to the Ferry Bldg location but have tried the Chinatown one. I also am a neophyte Chinese tea drinker and the GM usually isn't a tea drinker at all. It was a nice, relaxing experience. On the way out I bought a really expensive tea to which the GM said "That much for a small bag of leaves?" Until she realized that she herself at one point in her life had paid exorbitant sums for small bags of leaves. Oh, dim sum is one of the things I miss most about no longer living in the Bay Area! Sam, I'm tagging you for a childhood food memories meme. Looking forward to reading your answers. Enjoy! I'll be at ton kiang for dim sum when they open at 9:30 tomorrow should you care to get your dumplings on:). Coming from a childhood filled with Chinese tea memories (look for my post on my visit to two taiwanese tea houses real soon), this certainly sounds a bit of a "westernized" chinese tea experience. 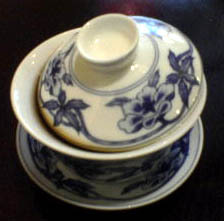 A traditional tea house would normally have the tea leaves brewed in its own pot and then poured into tiny "cha bei" (literally "tea cups") because chinese tea should be drunk in small quantities. You would refill the tea pot with piping hot water (which is kept hot on a set of coals or gas burner) everytime you wanted more tea. It's actually very ritualistic and slow going. The type of food normally served with chinese tea is NOT dim sum (I love dim sum, but traditional tea drinking is not an accompaniement) is normally a selection of nuts, seeds and dried fruit like plums. All said, it sounds like you enjoyed your visit during your day of shopping and that's the most important thing in the end. 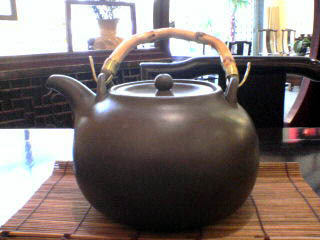 If you're interested in getting the lowdown in chinese tea try going to TenRen (http://www.tenren.com/california.html). They're very knowledgable and willing to explain the intricacies of Chinese tea ceremony. Joy - I am in 2 minds about taking you up on your offer, seriously. I will decide in the next 30 mins. Rose - thank you - it is more than useful to get the view of someone who knows what they are talking about. To be fair to the teahouse - they did have the kind of snack food you are describing too - I just decided to go for the dim sum option on that occasion. Thanks for the link - and I look forward to reading about your tea memory posts soon.